Who needs and deserves our dollars from now till November? Andrew Janz. Running against Devin Nunes in Fresno. Beto O'Rourke: Running against Ted Cruz in Texas. Harley Ronda...he's taking on Dana Rohrabacher, Putin's favorite congressman. And for god sake, he's leading the cold-war-warrior-gone-Russkie. 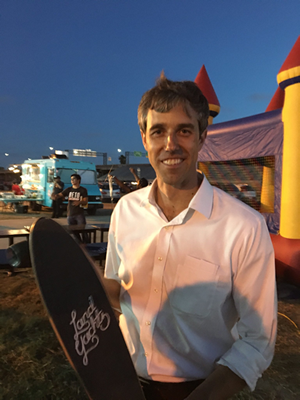 Dallas Morning News: A San Antonio supporter named Bryan, in his late 20s or early 30s, gave his Land Yachts skateboard to @BetoORourke. After long days, O'Rourke said, "you need a little, like, moment. So this going to be our zen. Right here. This skateboard." This article in Mother Jones ("The Most Vulnerable Trump Clone in Congress") indicates it's a "toss-up" between Rouda and Rohrabacher. Sadly, it also suggests that Nunes is practically untouchable. Seems like Janz has some charisma and is very likable, though, so praying for an upset there. I believe Nunes will be gone, sooner or later. Once the Trump Russia thing cracks wide open...he'll be run out of town. The 2-year cycle is brutal if you're a moron and protecting a criminal, possibly being a criminal. If Rohrabacher is in a toss-up, things have indeed changed. Considering Nunes' district, for Janz to close that much is still impressive. Janz probably doesn't have a great chance of winning in November (though if he gets close it could be setting the table for a future flip). Though a couple of months ago I would have said the same about O'Rourke and he seems to have closed rapidly. The Andrew Janz yard signs say "replacenunes.com across the bottom" That is reason enough to support him. The district is so heavily republican Janz will need about 20% of the republicans to flip the seat. My mom is one of those Republicans though, and she seems hopeful for Janz. She dislikes Nunes for many reasons, mainly that he is so much identified as a Trump shill. And that he seems to lack a functioning brain. Are there any former Tier 1 Operators contracting wet work? Looking like a Dem pickup now in East San Diego. Fun fact: Hunter was the 2nd congressman to endorse Trump, the first being Chris Collins. Sleeze respects sleeze. Seriously, W.T.F. is in the water in San Diego. There was also Randy "Duke" Cunningham who took bribes, rather stupidly. He rep'ed the CA 50 in SD as a GOP. Gonna bump this ^^^ Beto clip just one time as this man has a certain kind of magic going on here. Like future presidential magic. Video now approaching 300K likes. Colleagues, please check it out. Americans like young, tall, leaders who speak eloquently with intelligence. (see JFK, see Obama) Beto has it. He has to win that senate race...and if he does, yes I think the next move is the highest office in the land. Beating a GOP in Texass is a big fccking deal. Do that and you have power and momentum. This makes me think he actually has a shot at winning. This guy, Ammar Campa-Najjar, deserves to be send some funds in wake of GOP Duncan Hunter being indicted on corruption charges. And yes, it would totally freak out GOP San Diego...so good. The 29-year-old former Obama administration Labor Department official whose father is a Palestinian Muslim and mother a Mexican-American Catholic has never held elected office. In Hunter, he's taking on a widely known Iraq war veteran who coasted through the June primary in the most Republican district in Southern California with a 30-point, first-place finish after serving five terms. Bill Maher walks the walk. Good on Bill. 1% of his net worth. Didn't realize he had accumulated that much wealth. This is what the Democrats will be running on in the mid-term: CORRUPTION of the GOP. It won't be impeachment...just regular corruption, and there's plenty to go around with Trump, the Trumpkins and GOP...and all the swamp monster cabinet members and Trump's two big pals, indicted GOP congressmen Collins and Hunter. Steve Kerr: "Please watch this and be reminded of what thoughtful leadership looks and sounds like. Thank you @BetoORourke for giving us a glimpse of our future. Things will get better!" Tony Dungy: "If you want some insight into the National Anthem kneeling controversy, watch this. If you've already made up your mind that kneeling is disrespectful and facts and history won't change your mind there's no need to watch." Kurt Warner: "Every past & present fan of NFL - please listen - I believe he hit the nail on the head & he did so not by dividing the 2 sides but by joining them together in realizing the freedoms of our country have been forged by soldiers but also by many others who have fought in diff ways!" LeBron James: A Must Watch!!! Salute @BetoORourke for the candid thoughtful words! Ted Cruz: "Most Texans stand for the flag, but Hollywood liberals are so excited that Beto is siding with NFL players protesting the national anthem that Kevin Bacon just retweeted it. That means all of us us can now win Six Degrees of Kevin Bacon!" This guy... He'll be in a real election with distinct choices. DeSantis has been endorsed by the Orange Turd. The Tallahassee mayor will be the Democratic nominee in one of 2018's most important governor's races. Nice: Gillum is the first African American to win a major-party nomination for governor in Florida. Wow, nice photo of Paulie Walnuts...he's smiling like Putin just goosed him! I just donated to Manafort. Stuttering in a biitch, and requires a lot of personalized and expensive treatment from experts to regain the ability to speak like a person who is telling the truth. Wow, this guy has a chance. He has momentum now. 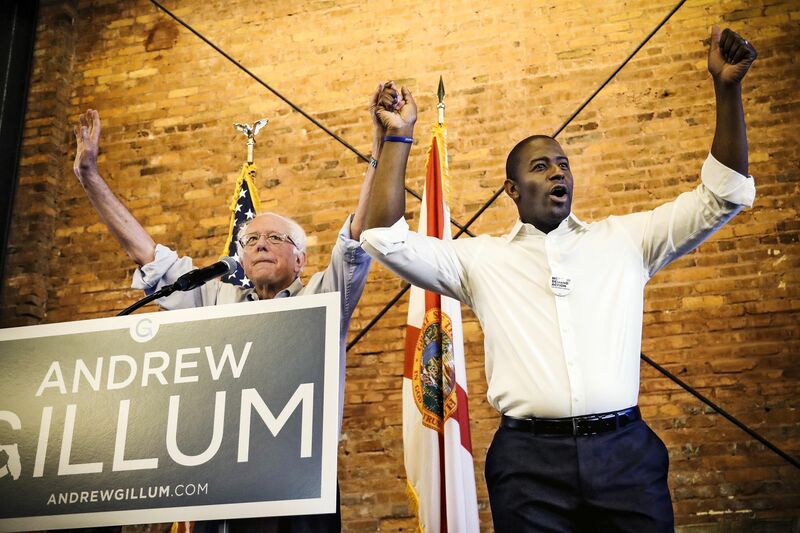 Reports are, Andrew Gillum raised $1 million in 24 hours after winning primary. An internal poll by Rep. Duncan Hunter's Democratic challenger Ammar Campa-Najjar shows the embattled Republican congressman in a tie in California's 50th District. A Palestinian Latino American is tied with a 2nd generation congressman. Another upset win in the Boston Dem primaries...Pink Wave is coming. Good to see you back in the hood, BW. ps. In Beto We Trust. Pressley beat a 20 year veteran of Congress who was actually a progressive Democrat-voted against the Patriot Act- and hadn't had an opponent for a long time. Voters just want new blood and a younger party. Pelosi's days are numbered. Agree, people want new blood. I've been saying generational change. I believe Pelosi will retire after 2020, maybe a term more. Despite it being time, I think Pelosi is the right person to hold the house together as they chase down Trump and the other criminals and traitors. She has good skills "herding cats" and counting votes, in a sense "mothering" things along. Also it would pain Trump greatly if a California liberal lead the charge. I just hope they don't let him off easy. As much pain as Beauregard Sessions being cross examined by Kamala Harris, not only a woman but God forbid, a person of color. It was so bad the little fellar publicly declared it made him so down right nervous he was fur gettin' Russians and stuff. Turns out the Texas GOP are worried shttless about Beto O'Roarke. A lot of it is how unlikeable Ted Cruz is, and you can see why here.